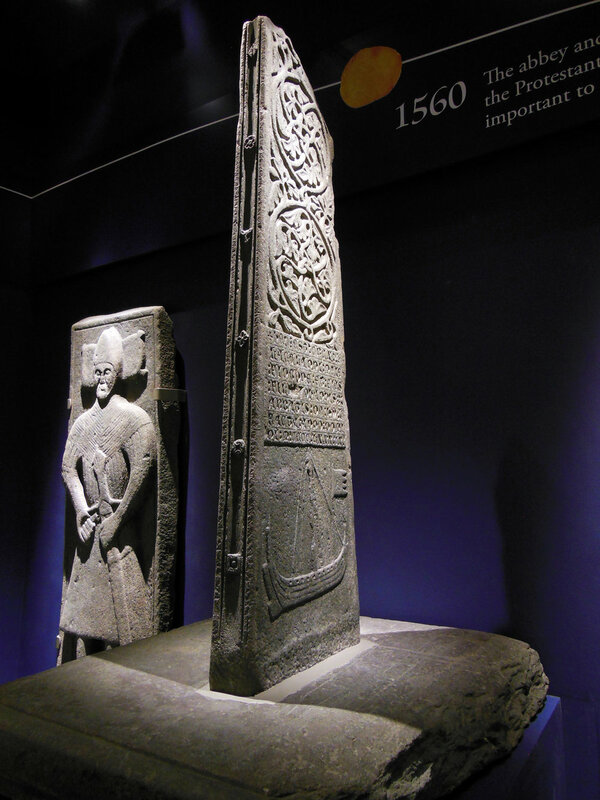 The visitor’s exhibition at Iona Abbey, which is owned and operated by Historic Scotland, houses a unique collection of dark age and medieval high crosses, grave slabs and grave markers relating to the island and its influence on the west coast of Scotland during the early centuries of medieval christianity after its foundation by St. Columba in the the 6th century. KSLD were brought onto the project at its conception with a very clear brief to ensure that the lighting brings out the texture and carving work of the stones, many of which had been badly eroded after centuries of exposure. 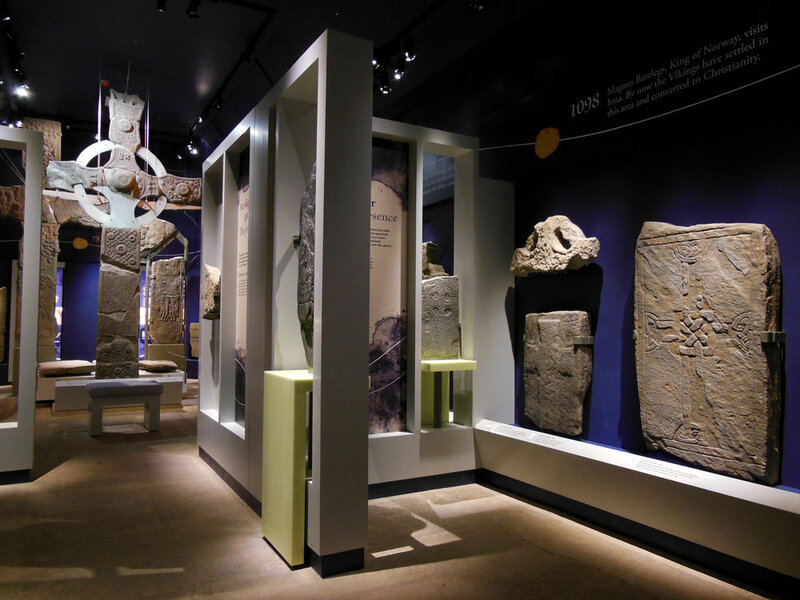 By working closely with the HS interpretation unit and exhibition designers, KSLD were able to ensure that the display of individual stones and location of lighting equipment were best placed to deliver the exhibition lighting qualities required. 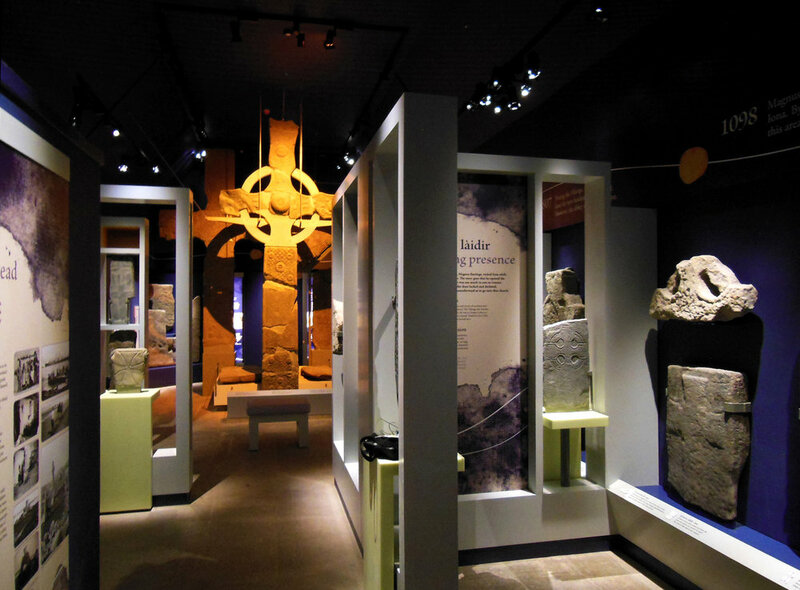 For the first time in an exhibition project, KSLD used LED light sources throughout, due to the remote location of the abbey in order to reduce energy and maintenance costs. The focal point of the exhibition is a trio of reassembled upright high crosses (St. John’s, St. Matthew’s and St. Oran’s) that were a result of artistic and theological experimentation particular to Iona. The location and orientation of these crosses in the landscape were very significant and was something that the interpretation unit wanted to address in the exhibition. In response KSLD created a dynamic lighting sequence that plots a notional sun-path around the central St. John’s cross simulating the changing aspects of the deep-recessed carvings on each face of the cross as the angle of incidence and colour temperature of natural light changes throughout the day - this sequence was coordinated with a change in the AV general soundscape track that gives audial clues to the daily rituals of the Abbey’s religious inhabitants.